Whipped Cream: Start by combining the heavy cream and the rosemary sprigs in a small saucepan. Bring the cream to a boil over medium heat. Once it reaches a boil, reduce the heat to low and allow the cream to simmer gently for 3 to 5 minutes. Pour the cream and rosemary into a container, cover and refrigerate overnight. Following, strain the rosemary from the cream and discard the sprigs. Using a handheld mixer or stand mixer, whip the cream into soft peaks. Add the powdered sugar and vanilla extract. Continue whipping until the cream reaches stiff peaks. Reserve in the refrigerator until needed. Don’t have time to whip up the homemade stuff? Store bought whipped cream can be utilized instead if time is tight. Just whip rosemary simple syrup into the store bought whipped cream and enjoy. To poach your Perfect Pineapple, first cut the pineapple into chunks, and then place the pieces in a medium-sized saucepan. Slowly add the Riesling, sugar, vanilla bean pod and seeds, and salt. Whisk to dissolve the sugar. Optional: Wrap and tie the black peppercorns in cheesecloth and add the sachet to the pot. Place the pan over high heat and bring the wine to a boil. Once boiling, immediately reduce the heat to low. 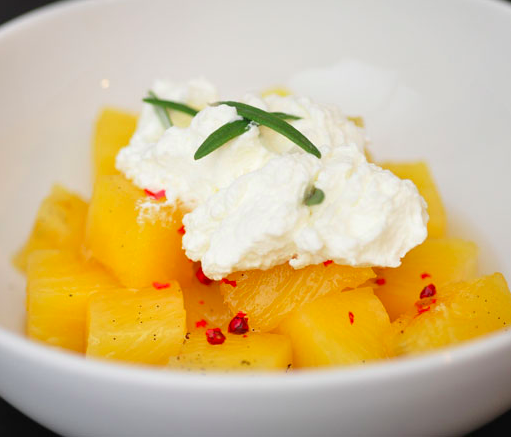 Poach the pineapple for 12 to15 minutes. Strain the pineapple and reserve the liquid. Refrigerate the pineapple until needed. With the remaining sauce: pour the strained poaching liquid into a saucepan and bring to a simmer over high heat. Simmer until it has reduced by slightly more than half and is thick and syrupy, about 10 to 15 minutes. To serve, place about a half a cup of poached pineapple into a chilled bowl or parfait glass. Drizzle each serving with a tablespoon of the reduced poaching liquid. Top each dish with a generous dollop of the infused whipped cream. Garnish with rosemary leaves and enjoy! Want more great recipes? Check out our recipe blog and get cookin! This entry was posted in Latest News, Recipes and tagged chestnut hill farms, pineapple dessert, pineapple recipe, poached pineapple, rosemary whipped cream, valentines day. Bookmark the permalink.